I shot my first Facebook Live cooking video alongside Chicago Biohacking Expert Anthony Diclementi. 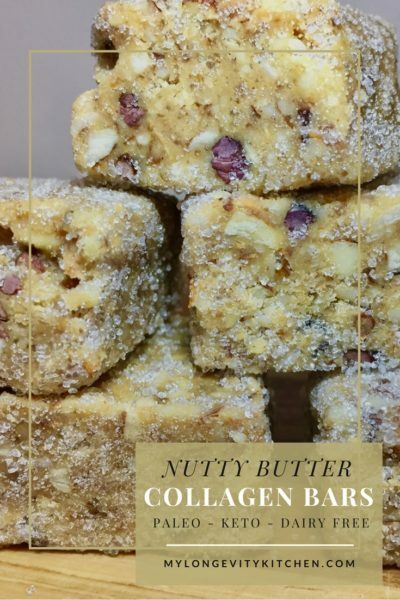 Anthony, a long time acquaintance and Hi-Vibe Ambassador, invited me into his kitchen for an informal live video about how to make my Nutty Butter Collagen Bars, all while we laughed and discussed why eating real food is so awesome. Watch the video to see Anthony’s reaction to my peanut butter substitution, and to see how you can make these low-carb, fudgy bars in 15 minutes. If you like the video below, please share on Facebook so we know you want more like this! 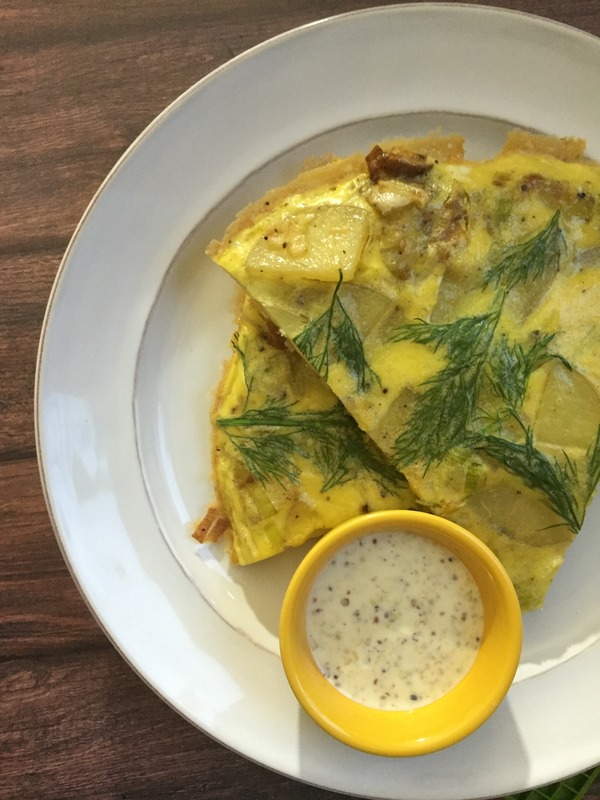 Scroll on down for the recipe. 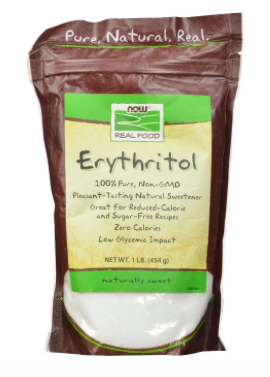 3 Tablespoons Birch Xylitol or Erythritol to sweeten (using 1/2-full packet of stevia is a good alternative). 1. Add your Nuts & Coconut flakes to a dry skillet and sprinkle with the Cinnamon. Keep the heat off for now. 2. Using a small sauce pan or pot, add the Butter, Nut butter, Vanilla, and Fine Sea Salt. Turn heat to LOW and stir with a spatula to melt everything together. 3. Once the butters are melted & combined, stir in the Collagen Powder, Cacao Nibs, and Xylitol/Erythritol. Turn the heat off. 4. Turn the nut pan on to medium heat. Toast the nuts carefully, watching that you don’t burn the coconut by tossing the nuts around about every 30 seconds. Takes about 3 minutes. 5. Once the nuts are fragrant and browning, chop them in a food processor (or using a sealed plastic bag you can take out your frustrations by smashing them with a heavy pan). 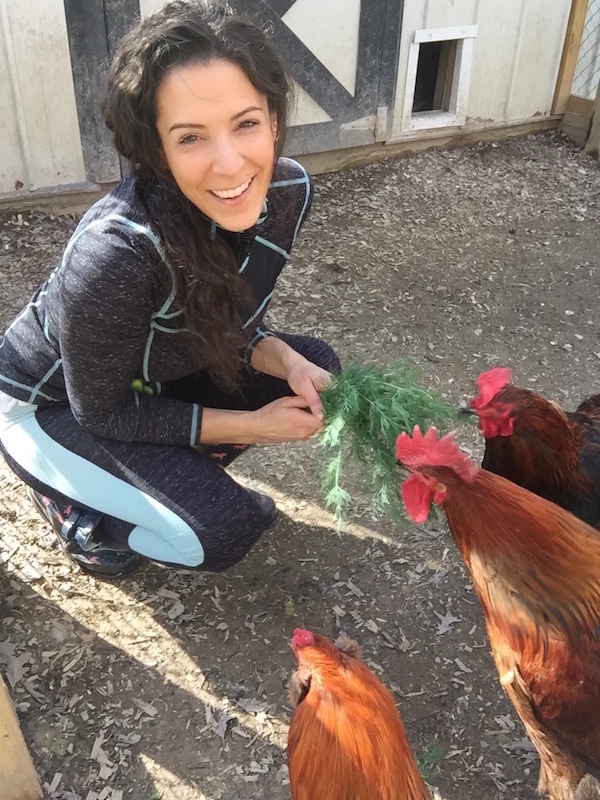 I like them more coarse than almond meal, but less chunky than chopped nuts at the store. 6. Add the chopped nuts to the butter mixture, stirring to combine (add your cinnamon if you haven’t already). 7. Line a food storage container (width of 7 inches or less) with parchment or wax paper along the bottom so you can release them easily once they cool. Pour the mixture into the container, spreading evenly, cover and refrigerate. 8. After at least 2-3 hours, once it’s solid throughout, remove the container and patiently wait 10 minutes to let it slightly thaw so you can slice it to perfection. Then slide a knife around the edges to loosen your masterpiece, and remove the entire mixture in one piece. Slice into squares. Keep refrigerated for the best eating experience. Soaking nuts in advance will make these bars even more nutritious, and easier on the digestive system. See the following directions for this technique. 2. Drain and rinse nuts thoroughly. Blend them in a food processor until they are coarsely ground and slightly chunky. Add 2 Tablespoons of Coconut Flour and whirl in the food processor one more time. Set this mixture aside to add into Step 6 as listed above. Continue now to step 1 and toast the coconut flakes. Nuts – Use any type of nuts you’d like, raw and unsalted. 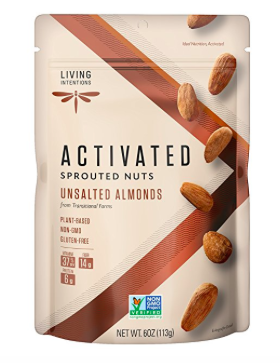 Or, for maximum health benefits, seek out brands like “Living Intentions” who are activating (soaking & dehydrating) the nuts for you. See above steps for soaking your own nuts. Nut Butter- Any nut butter will do for this recipe. I recommend buying sprouted nut butters like the ones by Destiny or Manna Organics (unsweetened only). 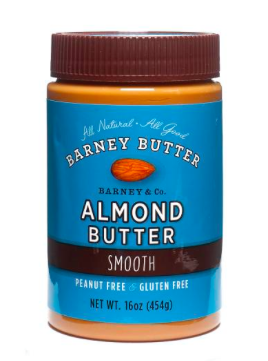 Or look for Barney Butter Almond Butter that’s made with blanched almonds. Unfortunately, both fry pans have disappointing reviews. I’m still looking. Also remember, any ceramic coated pans are sensitive to high heat. Most bad reviews are complaining about the non-stick feature wearing off. Without the traditional chemicals used on non-stick pans, a ceramic non-stick will start to “stick” if you heat it too high (like high heat on your burner for too long. Hope this helps! I’ll update the post now. What is the amount of one serving of collegan protein on teaspoon or tablespoon? Have fun with it! You’re safe going with 3 Tablespoons, all the way up to a half cup of collagen. 3 Tablespoons is the average recommended serving, or one “scoop” using the provided scooper, and my recipe here is for more than one serving anyways. Enjoy! Thanks for the measurements. The bars are delishious! The prices for the products are way to expensive. You’re right, some of these specialty products can be very expensive! 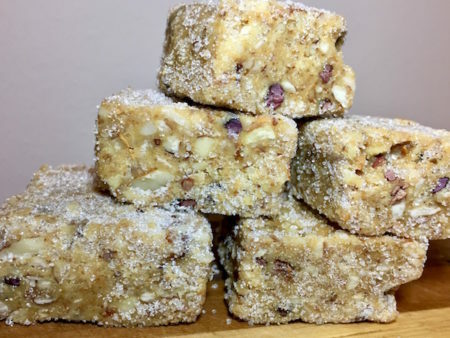 You can make this recipe with basic ingredients like nuts from the bulk bin, any nut butter of your choosing, and use stevia instead of xylitol/erythritol. I included these links because people were asking where to get the items we mentioned in the video. Have fun, I hope you make your own version and enjoy!